Officially known as the Kingdom of Spain (Reino de España, in Spanish), Spain is a major country in Western Europe. It is located on the Iberian Peninsula, which it shares with Portugal, and is situated south of France and the United Kingdom. Spain has borders with Portgual, France, Andorra, and Gibraltar, with the Mediterannean Sea being located off most of the country's eastern and southern coastline, and the Atlantic Ocean to the western side. Spain covers a total area of 195,360 square miles (505,990 square km), making it the second biggest country in Western Europe. It has an estimated population of 46.7 million. Spain has a rich history, with its land being divided and owned by various peoples, tribes, and cultures throughout the years. The Spanish Empire was the world's first global empire and Spain was the most powerful country on Earth for a period of time, colonizing large parts of the Americas. Spain has the third highest amount of UNESCO World Heritage Sites of any country and is a highly popular tourist destination due to its warm climate and countless beautiful beaches and cities. The capital city of Spain is Madrid, which is also its largest city. Read on for some additional details and overviews of the largest cities in Spain. Part of the Community of Madrid, the city of Madrid is Spain's national capital and largest city. Madrid is one of the largest cities in Western Europe and covers an area of 233.3 square miles (604.3 square km). The estimated population of Madrid is 3.1 million, with over 6.6 million living the surrounding metropolitan area. Madrid is located in the center of Spain and is a hugely important economic, touristic, financial, and cultural center for the country, as well as being the home of the Spanish government and political system. 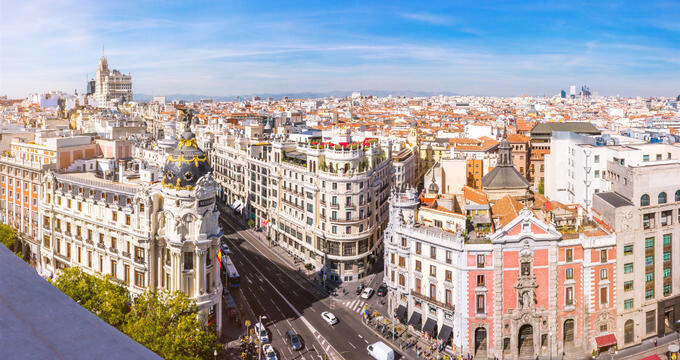 Madrid is well-known for its high standard of living and beautiful architecture, being home to many popular landmarks and points of interest like the Royal Palace of Madrid, the National Library, and the Golden Triangle of Art. Located in the Catalonia region of Spain, which has been pushing for independence for many years, Barcelona is the second biggest Spanish city. It is situated in the northeastern corner of the country, not far from the border with France. Barcelona covers an area of 39.2 square miles (101.4 square km) and has an estimated population of 1.6 million, with over 5.4 million people living in the surrounding metropolitan area. Barcelona is the capital of Catalonia and is seen as the heart of the region, with many residents identifying more commonly as Catalonian than Spanish. Like Madrid, Barcelona is home to one of the world's most successful association football teams, along with many museums, galleries, beautiful buildings, and sites of interest. Part of the Valencian Community, Valencia is the third largest city in Spain. It is located on the east coast of the country and covers an area of 51.99 square miles (134.65 square km). The estimated population of Valencia is 780,000, with over 1.7 million people living in the surrounding metropolitan area. Valencia is a city with a lot of history behind it, being founded in the year 138BC and originally known under a Latin name of Valentia. It was a Roman colony and underwent many drastic changes over the years. Nowadays, Valencia is a popular touristic city due to its many festivals and cultural events. Situated in the Andalusia region of Spain, Seville is the fourth biggest city in the country. It is located on the floodplain of the Guadalquivir River and covers an area of 50 square miles (140 square km). The estimated population of Seville is 703,000, with more than 1.5 million in the city's metropolitan area. Seville has played a key role in major events throughout Spanish history, like the Spanish Civil War, and is filled with historical buildings and monuments like the St Mary of the See Cathedral, the Plaza de España, and the Torre del Oro. Located in the Aragon community of Spain in the Zaragoza province, Zaragoza is the fifth largest Spanish city. It was founded on the banks of the Ebro River and covers an area of 375.98 square miles (973.78 square km). The estimated population of Zaragoza is 665,000. The city was founded by Romans and originally called Caesaraugusta. The city is well-known for being a big contributor to Spanish cuisine, with plenty of popular regional dishes and specialties, as well as being the location of several Mudéjar Architecture of Aragon buildings.